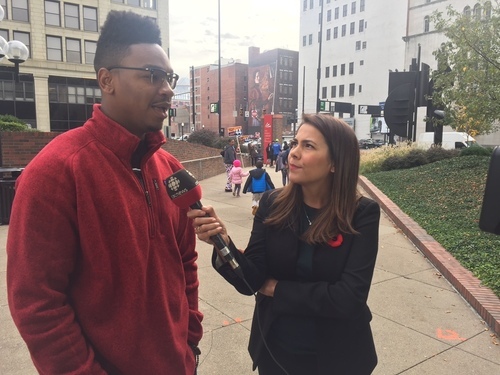 In the final weeks of the increasingly contentious presidential campaign, CBC News reporters spoke to people in key states and asked: "What, to you, is this election about?" As the 2016 U.S. presidential election draws to a close (finally), we take a look at some of the moments from the many campaign rallies held by Hillary Clinton and Donald Trump. Dom Clemer, 24, voted in his first presidential election and cast a ballot for Hillary Clinton today at a polling station in downtown Cincinnati. He says he came out to stop Donald Trump. "You can look at his Twitter feed, it speaks for itself." Clemer says he will open a bottle of champagne with his friends tonight if Clinton wins. Others at the voting place here say no matter who they are voting for, they are anxious and ready for this "nasty" campaign to be over with. Dom Clemer voted for Hillary Clinton today. A related note about Trump’s lawsuit in Clark County, Nevada. It’s not uncommon for a campaign in the U.S. election to launch a lawsuit, claiming some sort of voter irregularities. Both campaigns have an army of lawyers at their disposal. According to Bloomberg, Clinton’s team assembled a voter protection program that has drawn thousands of lawyers who will lend their time in battleground states. Meanwhile, the Republican National Lawyers Association hopes to have 1,000 lawyers prepared to challenge results. It may sound a bit odd, but while we're watching out for the lineups to vote, we're also watching lineups at a Rochester, N.Y., cemetery. It's where U.S. suffragette Susan B. Anthony is buried. 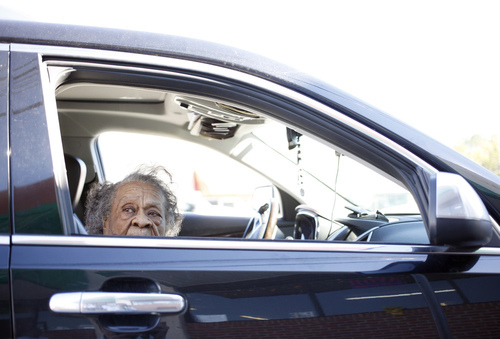 She fought for a woman's right to vote, but didn't live to see that happen. All week, early voters have been attaching their 'I voted' stickers to her grave. Suspecting that, if Hillary Clinton wins, the little grave could become a place of pilgrimage tonight, the cemetery has extended its opening hours. A Nevada judge rejected a request by Donald Trump's presidential campaign for an immediate order to be issued in its lawsuit over concerns about voting at a polling place in Las Vegas that remained open late last week. Judge Gloria Sturman at the Clark County Court said that the order would potentially make public the identities of poll workers, which could put them at risk of harassment. Most voters are casting their ballots across the United States on Tuesday in the general election but Nevada and several other states allow early voting. When over half the state has already voted, some polling precincts here in Miami-Dade County are dead quiet in mid-afternoon. Gone, for now, are the bitter memories of long lineups and polling snafus from 2012. Democrats in Florida are feeling more plucky after early voting returns and polls suggesting Clinton benefited from the last 48 hours of campaigning. Here’s how Florida’s advance voting broke down compared to 2012. Of 6.4 million voters, 66 per cent were white, down two per cent; black voters were down three per cent to 13 per cent; and Hispanic voters were up two per cent to 15%. 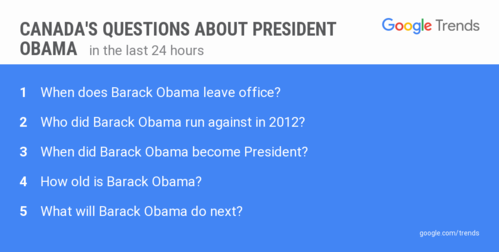 That may not seem particularly dramatic, but the trends favour the Democratic party. 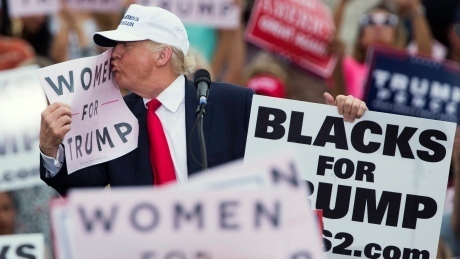 Donald Trump’s strategy to appeal to white disaffected voters, coupled with his comments on some Mexicans as rapists and criminals, may have helped seal his fate in Florida. "I think what he’s done is inspire a record Hispanic turnout," says political scientist Fernande Armandi at the University of Miami, predicting a Clinton win. "He built a wall all right, but it's ironic, it’s the Democratic firewall, which are Hispanic voters." 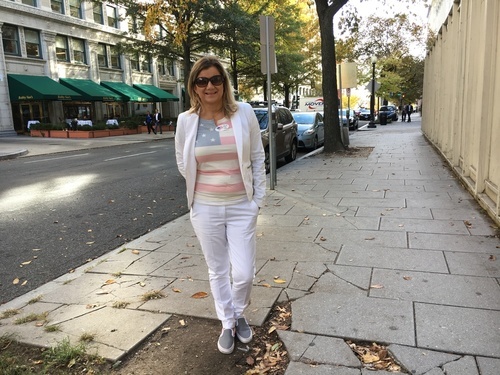 Something we're seeing a lot of in very Democratic Washington, D.C.: A lot of white, and a lot of pantsuits. White was the official colour of the suffragettes who fought for the right to vote in the early 1900s. Here are a few shots from around Pennyslvania Avenue and the White House this afternoon. Also being tested today: Trump’s undercover base. Does it really exist? Trump and his supporters like to talk about a so-called "silent majority," which refers to this notion that there’s a secret bastion of Trump supporters that isn’t being reflected in the polls simply because, for whatever reason, they aren’t willing to speak out about their backing of the New York real-estate magnate. 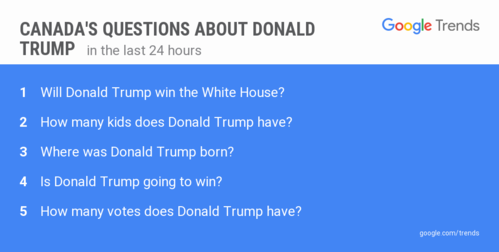 It's a cliche, but the only poll that matters is the one on election night. Turns out Trump’s election night headquarters (the midtown NY Hilton) is only a couple of blocks from his penthouse at Trump Tower, which in turn is only a couple of more blocks from PS59, the polling station where Trump is registered to vote. 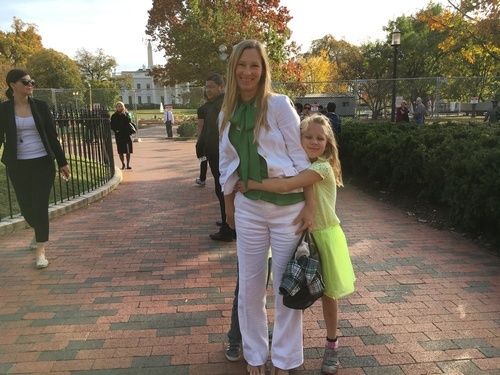 And as all candidates do -- this morning he went to go put an X next to his name in the box for president so we thought we’d go watch. 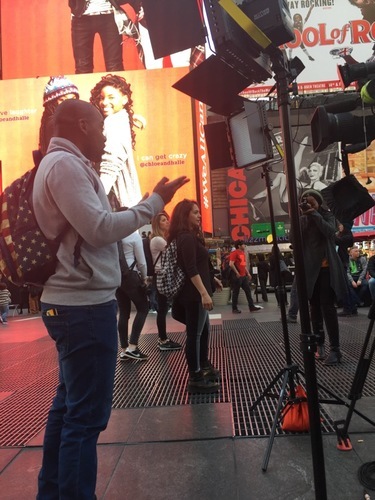 Hello from Times Square where I'll be positioned tonight. This famous crossroad is located right between Hillary Clinton's event and Donald Trump's. We'll be chatting with Americans here to get their take on this long and brutal election campaign. There are lots of other cameras here tonight and already we've become a photo opportunity for tourists who find themselves here on this potentially historic night. Hopefully the Americans who are here tonight visiting from other parts of the country have already cast their ballot. By the way, it might take a while to get inside Trump HQ. They’ve been doing a security sweep most of the day and only now have begun handing out media accreditation. And it’s a monster lineup. In fact, CBC News finally managed to secure that it’s even on the list only this morning. The Trump people booked a small(ish) room for the event tonight and said they had more applications than they could accommodate. But hard lobbying paid off and we hope to be inside before long. Did FBI Director James Comey sink Clinton’s chances? 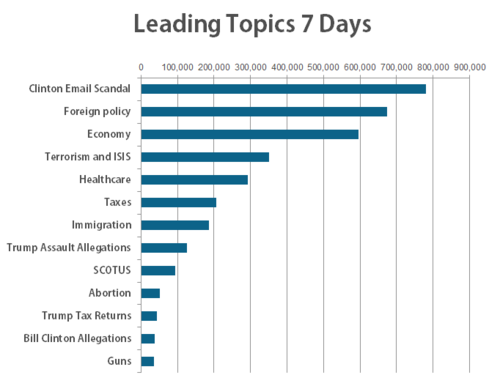 The leading topic nationally on Twitter going into today’s election is the Clinton email scandal. For those just tuning in, the FBI conducted a multi-year investigation into Hillary Clinton’s use of a private email server during her time as Secretary of State. Clinton was found to not have committed any crime, but was called extremely careless by FBI Director James Comey. Comey broke with protocol earlier this year to make that statement and broke with protocol again on Oct. 28, with a letter to the U.S. Congress informing them that potentially new emails had been found on the personal laptop of Anthony Weiner, the estranged husband of Clinton senior aide, Huma Abedin. 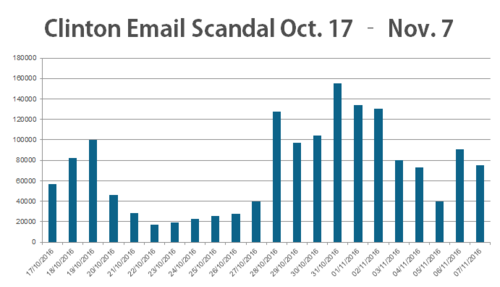 Compared to the 11 days prior to Comey’s letter, mentions of the email scandal increased by 138 per cent. However, just this past Sunday, Comey sent yet another letter to Congress clearing Clinton of all wrongdoing. Today’s election will determine how much damage has been done. In terms of swinging the election results, Arizona is likely the second most important Latino vote in the country, behind only Florida. Here, Latinos make up more than 20 per cent of likely voters, and about two thirds of them are supporting Hillary Clinton. But according to some experts, 2016 wasn’t the election in which Latinos would provide the tipping point. "This trend towards moving to perhaps a more purple state was probably eight to 10 years off," says Thom Reilly, a political science professor at Arizona State University. 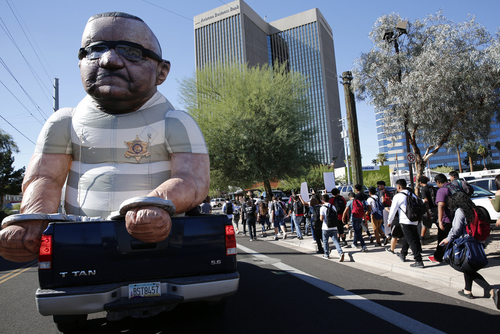 "So the fact that Arizona now is in contention, perhaps, of being a tossup state caught some people by surprise. This election, Arizona’s Latino community has set a record for voter registration and early voting; Hispanic early voting could be double that seen in 2012, which bodes well for Clinton. "If Latinos vote at the same rate they have in the past, Trump will win," says Canadian-born political scientist Samara Klar, who now teaches at the University of Arizona. "If it increases substantially, then Clinton will win." 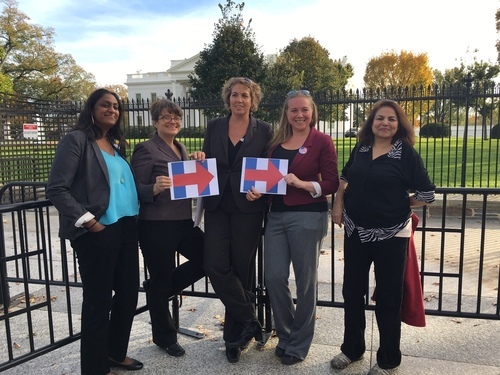 From CBC's Adrienne Arsenault: No mistaking the women of Pantsuit Nation. 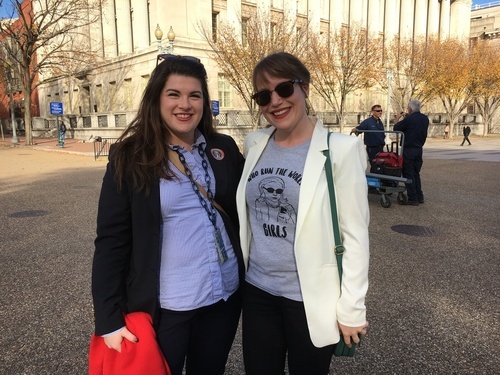 Gathering outside the White House today with their "I voted" stickers and yes, their pantsuits, the story of these women is actually of how they have been gathering online for a while. And we’re not talking gathering in the dozens. The women today maintain that their "secret" Facebook group is approaching two million members. Secret? Seems it hasn’t always been easy to be open about supporting Hillary Clinton. 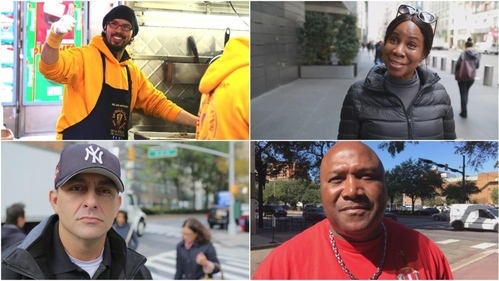 "Lots of posts from people who don’t feel like their family members, their town or their coworkers would appreciate their vote," Sharon Mcdonald told us. 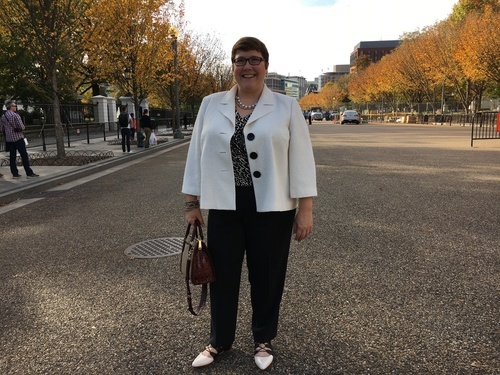 Some talk of a stigma, others of being harassed. It certainly happens to women when they tweet about politics. That’s why the stats suggest it is mostly women on Twitter, but mostly men who tweet about politics. One theory for that is a lot of women decide it’s just not worth it. Or, they decide to join secret Facebook groups. If you’re an eligible American voter on planet Earth and haven’t cast your ballot, NASA astronaut Kate Rubins might put you to shame. 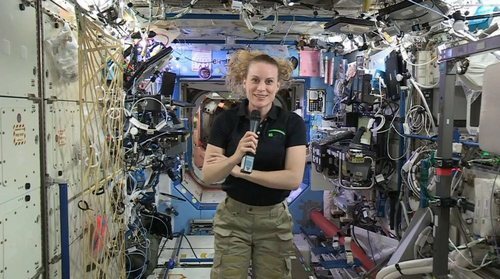 It was reported last week that even Rubins, the 60th woman to fly in space (and now back on solid ground), voted by absentee ballot from the International Space Station. The Texan's absentee ballot listed her address as “Low-Earth orbit." An hour north of Cincinnati, the tension has been building in Warren County, a Republican stronghold. Lebanon Mayor Amy Brewer, a Trump supporter, says she hasn't seen anything like it before, and that no matter what the outcome her community will be changed forever. "There will be fractured relationships when this election is all done." Brewer says it’s not just Democrats versus Republicans. The Republican Party has been struggling to get behind Trump because Ohio Gov. John Kasich would not throw his support behind the presidential candidate. For Brewer, this is the first time she hasn’t put an election sign up in front of her yard, because it's all been so divisive. 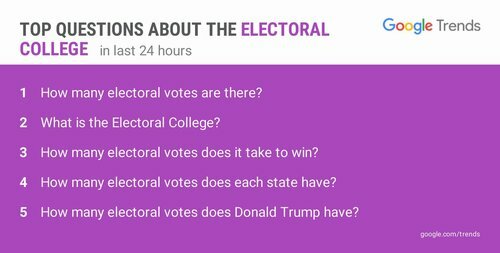 Trump’s hunt for 270 electoral votes is much more challenging than Clinton’s. That’s why Nevada, where he just launched a lawsuit, is important. It only has six electoral votes but Trump has to scrounge for as many as he can to win. The RealClearPolitics average has Trump slightly leading there by 0.8 per cent. Yet the folks over at the statistical analytics website FiveThirtyEight.com say Clinton has a better chance of winning the state than Trump. Democrats are leading in early voting there. (Obama won the state in 2008 and 2012). Respected Nevada political reporter Jon Ralston has said Trump "needs a miracle" in that state to win. Meanwhile, Trump supporter, friend and former adviser Roger Stone has said that "Trump has run one of the worst campaigns in modern political history in the state." Authorities say an argument between a woman supporting U.S. presidential candidate Hillary Clinton and another backing Donald Trump near a southeastern Michigan polling place led a man to shove one of the women, spurring on a larger fracas. Washtenaw County sheriff's spokesman Derrick Jackson says the women started arguing outside Tuesday morning after voting in Ypsilanti. Jackson says a man "interjected himself" and shoved one of the women, who fell but wasn't injured. After that, he says, other people "started getting into the fray," but no other violence was reported. It wasn't immediately clear how many people were involved or which candidate the man was supporting. Sheriff's deputies broke up the argument and took names, but nobody was arrested. In every battleground state we are reviewing except for Pennsylvania, the Clinton email scandal is playing second fiddle to discussions about the economy and foreign policy. 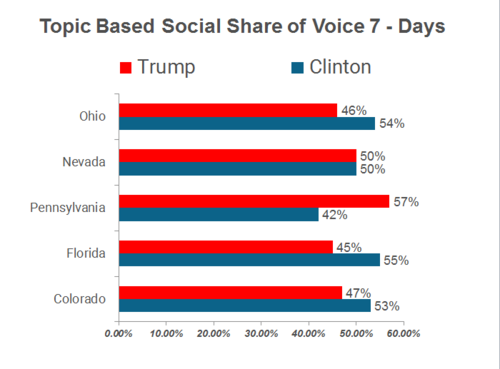 Based on conversations about both candidates collected from the past seven days, we’ve produced a share of voice analysis that showcases levels of support from Twitter users in that state. In Ohio, Florida and Colorado, commenters speak favourably of Clinton between 53 and 55 per cent of the time. However, in Nevada both candidates are in a dead heat. 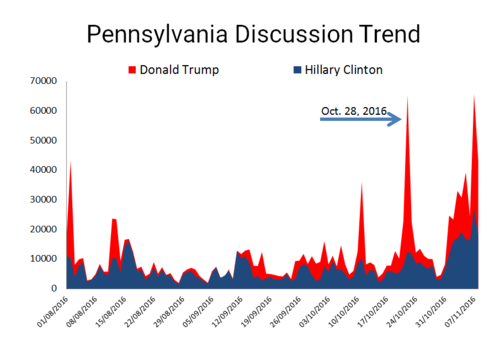 And Clinton is losing to Trump on social media in Pennsylvania, where discussions of the Clinton email scandal lead the way. Here’s what the discussion trends look like in Pennsylvania. See where it begins to trend upward for Trump substantially? That’s the impact of FBI Director James Comey’s letter to the discussion. There's a small stage set up outside the Javits Center. 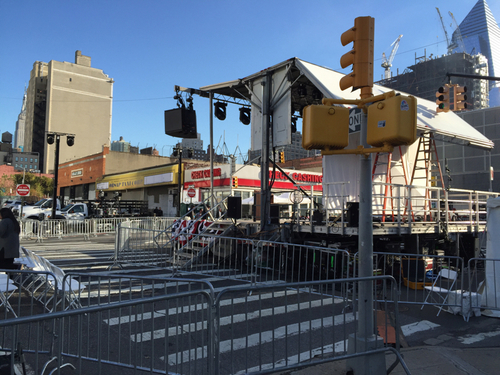 Hillary Clinton's campaign is expecting an overflow crowd on a lovely evening. It's 18 degrees and sunny now. We're trying to guess who the entertainment might be. Stage looks too small for Beyoncé - but Hillary Clinton is clearly ahead in the star power department. Katy Perry, J Lo, Springsteen have all performed at Clinton rallies recently.